Hunters are a powerful group. Last weekend I attended the Warsaw Lions Fall Classic, a fundraising event just miles from my hometown. It was one of the most impressive such events I've ever attended, and I've been to a lot of them. Their committee worked with eagerness and enthusiasm. The venue was a community gym (which I hadn't been to since a birthday party two decades ago - one of those awkward dances where the boys hang on one side of the gym and the girls giggle on the other). But this crew transformed those hardwood floors into a rustic fall banquet, with real centerpieces planted in driftwood, table cloths that resembled gator skin, and wagon wheel chandeliers hanging from backboards. Committee members grill steak and lobster out back, while wives and girlfriends serve VIP tables with a smile. Total attendance is around 375 people, and every single had a full belly and a full glass for the night. At the end of the night, the event had raised $130,000. I'm telling you, it was impressive. But what struck me the most was the energy of the attendees. The Fall Classic has become the social event of season, maybe even the year, and people showed up to have a good time and show their support. Most of the money stays local, so you can drive around town and actually see retaining walls, parks and other projects funded by the event. You know the names of the high school seniors that get the scholarship money. You can see the group's efforts at work. Combine that with a cash bar and a couple of great auctioneers, and the stage is set for wallets to open. Which brings me back to my first point. Hunters are a powerful group for a lot of reasons. We've wiped out entire populations of game through overhunting, and then brought them back to thrive once we came to our senses. We've funded every major conservation effort in this country, whether directly through donations or indirectly through excise taxes on guns and ammo. We keep wildlife at healthy population levels. Our vote is powerful. We form the silent majority throughout rural America. But most of all, we show up when it counts. I think it's because the qualities that make a good hunter also make a good human. Patience. Passion. Resilience. Dedication. A willingness to learn. Awareness - not only of your surroundings, but also of yourself and your abilities. There's also an odd combination of grit and self-reliance, contrasted with a willingness to share and support each other. The crowd at the Fall Classic isn't made up of billionaires or corporate tycoons. It's farmers, fire chiefs, insurance agents and teachers. People I grew up with and went to high school with. Heck, there's less than 20,000 people in the entire county. The busiest place in town this time of year isn't a college campus or a boardroom, it's the grain elevator. But like we always do, when it comes time to put our money where our mouth is, hunters show up. Rural America shows up. We stand for the National Anthem, and before we sit down, we get our wallets out. Congrats to the Warsaw Fall Classic on another record-setting event, which you can see in the photos below. Good luck in the woods this fall, and see you next year at the 2019 Warsaw Lions Fall Classic. A series of three whitetail sketches framed together raised $1,000 for the Warsaw Fall Classic. Framed similar to the whitetails, this trio of longbeard sketches was also a hit at the event. Definitely the most unique item I’ve ever brought to the Fall Classic, this painted YETI Tundra was a much talked about piece and now has a new home in Hancock County, IL, in addition to raising nearly $2,000 at auction. Here’s the time lapse of the YETI Tundra from my studio in preparation for the event. 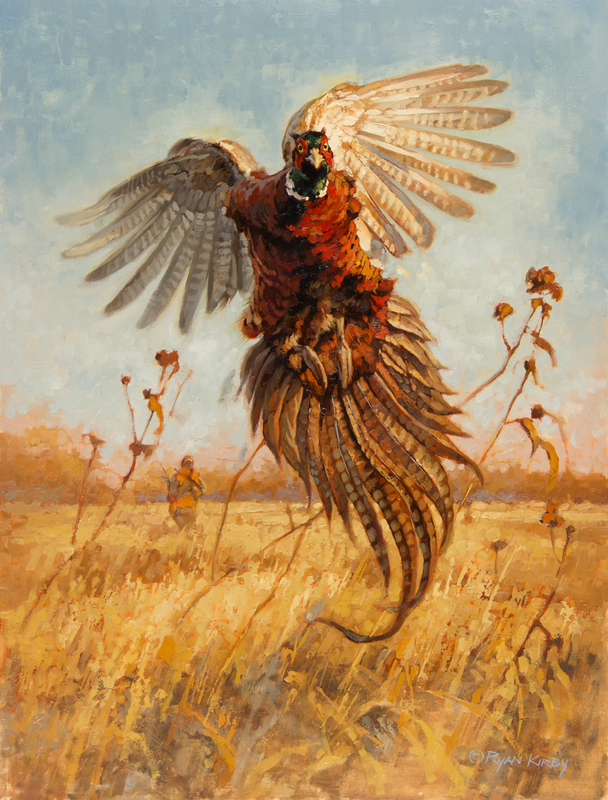 My featured original for the 2018 event, “Final Flight” raised $7,000 at auction and will now reside at the gun club two miles from where I grew up.